Flamingos: Copyright EAD-Suaad Al Harthi. The Greater Flamingo is the largest of the species. The Environment Agency – Abu Dhabi (EAD) says that the Greater Flamingo is once again breeding in the Al Wathba Wetland Reserve. 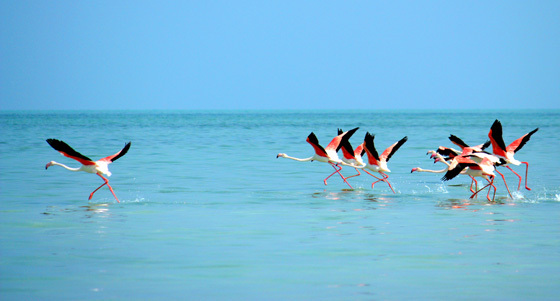 Bu Tinah Island, off the coast of Abu Dhabi and one of the 28 Official Finalists in the New7Wonders of Nature, is also home to hundreds of flamingos. “The breeding by flamingos in this Reserve is further evidence that protecting such areas is crucial in the preservation of our biodiversity,” said H.E Razan Khalifa Al Mubarak, the EAD Secretary General. “Our tracking programme allows us to observe their migration patterns and enables us to see what is needed to support a healthy habitat for these important birds,” she added. The Greater Flamingo (Phoenicopterus roseus) is the largest of the species and its habitats range from the western Mediterranean Basin to Sri Lanka in the north and South Africa in the south. It is a frequent visitor to the United Arab Emirates and can be seen all year round in lagoons, artificial wetlands and even close to human settlements such as suburban homes and industrial areas.